Everyone has been in a picture at least once in your life. While a camera alone can’t stop you from making that funny face in all of your pictures, it can make or break those family photos from thanksgiving. I want to say up front that I own both a DSLR and a Point and Shoot, and have been using both for years. I also want to point out that I am not an end all expert on everything photography, but I know my way around a camera. One of the most common misconceptions is that megapixels are everything. Many people can look at a point and shoot with 10 megapixels, and assume that it is automatically a better camera than the infamous Nikon D40, a 6.1MP DSLR. While Point and Shoots are used by the majority of people, a DSLR will almost always provide a better image, because of the larger image sensors that the DSLR usually employ and the equally important high quality larger optics. What this means is that the image from the point and shoot will often look grainy, while the image from the DSLR will usually be much more crisp and vibrant. Many people don’t know exactly what a DSLR is, so I’ll try to make it as simple as I can. A digital single-lens reflex camera (digital SLR or DSLR) is a digital camera that uses a mechanical mirror system, pentaprism, or other mechanism to direct light from the lens to an optical viewfinder on the back of the camera. The other primary difference between a DSLR and Point and Shoot is the ability to exchange lenses and manually control the camera to a much, much finer degree. The result, more control and better pictures. DSLR’s have many strengths. The first and foremost is as mentioned earlier the ability to change lenses. You can have an almost unlimited number of lenses that can cover any method of photography from telephoto (zoomed way in) to fisheye (extreme wide angle). 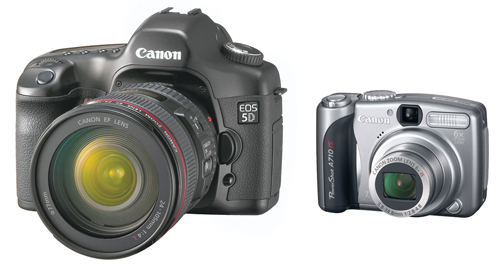 This means that you can have one camera, change your lens, and take virtually any kind of pictures you desire. The larger image sensors have the ability to capture much more light, making the DSLR a much better choice for low light photography, or photography where flashes are restricted. Some optional lenses have larger apertures, making them ideal for low light photography as well. These cameras also traditionally have much faster shutters, which, coupled with the large image sensors and large apertures and lower ISO’s, allow for extremely clear, sharp pictures. This is great for fast moving objects such as sporting events or kids that have had too much Mountain Dew. DSLRs may be some of the best cameras out there, but they aren’t for everyone. There are many weaknesses that may make a DSLR something that you should take a pass on. First and foremost is price. DSLR’s can cost literally up to thousands of dollars for professional models. One of the best DSLR’s at the moment is the EOS-1Ds Mark III. The body of this camera alone costs almost $7000, meaning that you will probably spend $10,000 to get a decent camera/lens combination for this body. While lower end consumer models with lesser features can be found with lenses for around $600, price is still something to consider. Something else to look at is the size and weight of a DSLR. If you were to try and carry a DSLR everywhere, you would hate life. They are generally too heavy and awkward to hang around your neck 24/7, meaning if you want to get a picture you better be expecting to take a picture. Recent advancements in micro four thirds sensors and bodies is changing this situation and DSLR cameras can be found that are significantly smaller and lighter than ever previously available. Such cameras include the Olympus PEN E-PL1 and the Panasonic Lumix GF2. These cameras are redefining the concept of the DSLR with sizes and weights closer to traditional point and shoot cameras. As this technology is refines we expect more manufacturers to employ this design and at reduced prices. Today the DSLR market is still dominated by models with a physical size and weight of 2-3 times that of your typical point and shoot camera. Another thing to take note of is the complexity of a DSLR. 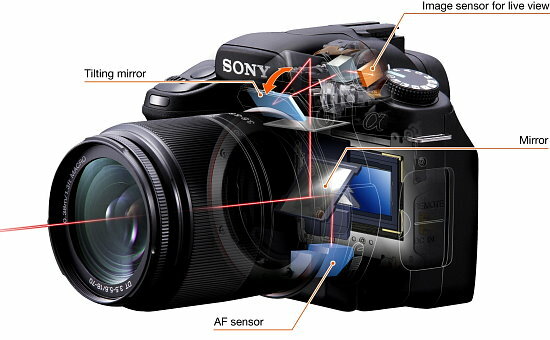 Although most DSLR’s come with an AUTO (“dummy”) mode, they are meant to use manual settings. This means you need to take the time to learn what each setting is and what it does. The outcome of your pictures is also going to change based on the lens that you have attached.